Transferred from Division of Recreation and Intercollegiate Athletics, 1999 (Accession Number 1999:49). Additional material was transferred from the Office of Athletic Communications in March 2016 (Accession Number 2016:12). This collection is arranged in four series: scrapbooks, honors and awards, presentation book and photographs. The first box contains the ten signatures and loose photographs from one of Hollenback’s scrapbooks, while the other two scrapbooks are housed with original binding intact in the second two boxes. The final three series are in the fourth box. Following his graduation in 1908 with a degree in Dentistry, Hollenback was head football coach at Penn State (1909, 1911-1914), the University of Missouri (1910), Pennsylvania Military College (1915) and Syracuse University (1916). He also served as advisory football coach at the United States Naval Academy and the University of Pennsylvania (1919, 1921). In 1951, he was elected to the National Football Hall of Fame. Hollenback became president of the Bird Coal Company in 1914 and would later serve as director of the New York Shipbuilding Corporation, the Keystone Portland Cement Company and the Coal Operators Casualty Company. In addition to these directorships and owning the William M. Hollenback Coal Company, Hollenback also had a brief political career. He was elected as a Republican to the Philadelphia City Council in 1939 and served one term from 1940-1944. In 1966, Hollenback and his son, William M. Hollenback, Jr., jointly agreed to donate $150,000 to the University of Pennsylvania toward the building of the William M. Hollenback Center, a physical education and military science facility. The Hollenback Center was completed in October of 1968, seven months after Hollenback passed away at the age of 82 on March 12, 1968. Hollenback married Marion Cressman in 1917 and fathered one son. Hollenback’s three main scrapbooks, which span the dates  to 1960, are the centerpieces of this collection. 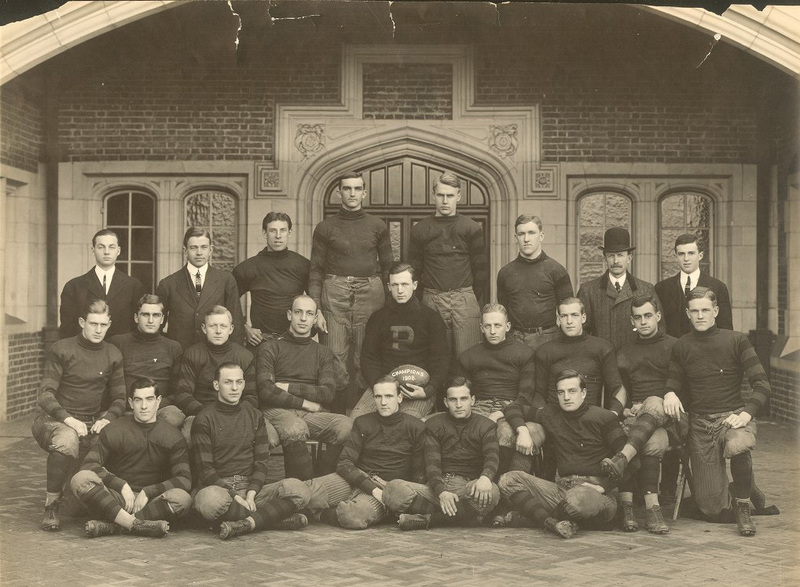 Newspaper clippings about Hollenback and the University of Pennsylvania football team’s exploits from 1906-1908, including later retrospective articles, comprise the bulk of the material in the scrapbooks. Clippings about Hollenback’s coaching career and the later careers of friends and former teammates, as well as assorted photographs, are also prominent. Photographs make up a large portion of the rest of the collection. Included among these is a combined photo album and scrapbook containing a concentration of photographs of Hollenback, teammates, friends and family and correspondence from his football playing and coaching career, 1905-1921. The photo album and scrapbook also contains some correspondence relating to reunion dinners and other newspaper clippings dating from ca. 1920 to 1954. The remainder of the collection is composed of, among other things, Hollenback’s varsity football letters of 1906 and 1908 from the University of Pennsylvania and the title page of a book given to Hollenback by Bill Roper.